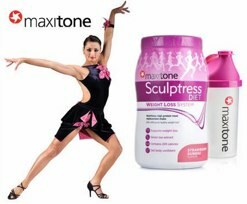 MaxiTone are responsible for several products in the weight loss genre ranging from diet drinks, slimming bars and of course diet tablets. MaxiTone appear to target their product specifically at women although there shouldn’t be any reason why men cannot use – there is nothing gender specific that would prevent men from using. A marketing decision we can only surmise. Sold in many high street outlets and third party stockists, there is no shortage of places to buy, the question is – should you? Sculptress is arguably the most high profile and popular product with the entire range. 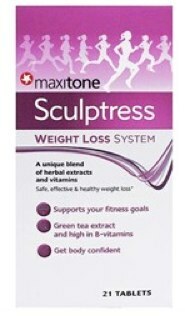 It is a diet capsule that is sold in packs of 21 and priced around £10. At first glance it appears quite cheap but the dosage is 3 times a day so one packet will last around a week so you will need to buy 4 packs to last a month. Sculptress is a fat burner that has been formulated to help get rid of the stubborn fat around the problem areas such as your waist, buttocks and thighs. Sculptress capsules are recommended to be taken up to 3 times per day and designed to help support a reasonably strenuous exercise regime by providing a mental boost and raising alternes levels before and during your workout. There are B vitamins included in the formula that are said to help support the metabolic rate and the rate in which the body burns calories and energy production. Chromium is included that acts to help stabilise blood sugar levels. Should not pose a threat to health if the manufacturers directives are followed. It should go without saying that expecting or nursing mothers should avoid. Anyone with a health condition should consult with their GP or doctor prior to use. There appear to be a lack of testimonials and success stories (even on the Maxitone website – which is a tad strange). There are not too many positives we can draw from Sculptress. Others preferred. High street purchases can be mande from premium stockists of diet supplements such as Holland and Barrett. Can be ordered from the MaxiTone website as wel as several other authorised suppliers. Costs around £10 for a 7 day course. Its hard to recommend any other fat burner over and above Capsiplex. 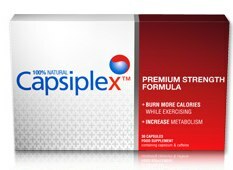 Capsiplex is British product that has been available to buy without prescription for the last two years and has all but dominate the fat burner genre. Capsiplex contains capsicum and is said to help burn calories of a rate of 280 per capsule. With many success stories attributed to it, Capsiplex should be high if not top of your shortlist.